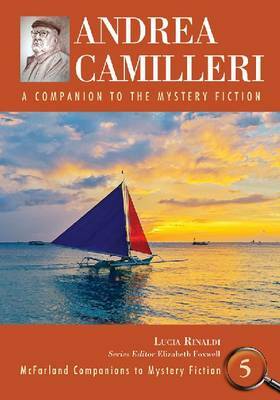 This fascinating compilation is a complete accessory to the Inspector Montalbano novels and short stories by Andrea Camilleri. So far, only the novels have been translated into English, with about five more to go. If you have read and enjoyed them all, as I have, you'll probably find much to fascinate you in this academic, yet accessible, book. Lucia Rinaldi sets out her credentials and her mission in a clear preface: she then provides full lists of all Camilleri's works in various orders; a biography of the author; and a chronology of his career. For me, these essays are particularly fascinating in the light that they cast on the subjects Camilleri includes in his novels, for example the Sicilian involvement in World War II and its aftermath (Camilleri and his father had distinctly different sympathies) and the relative merits of "literary" vs "crime" fiction, a controversy in which both Camilleri and his characters become involved. The bulk of this book is the "companion", an alphabetical encyclopaedia of short summaries of the novels, short stories, characters, settings and context of everything in the Montalbano books, complete with many black-and-white stills from the Italian TV series Inspector Montalbano and cover illustrations of the Sicilian editions of the books. My only slight gripe with the format is that the titles of the novels and short stories are in Italian (though the rest of the book is in English), so in order to find an entry about a novel or short story, one has to flip back and forth between the list of Italian/English titles at the beginning. Perhaps it would have been easier for readers if the "companion" had been organised in sections, starting with the books, then the characters, then the other topics. Even so, this is a very useful reference work, particularly for the reader who might want to refresh her memory about the last book in the series before starting the next one, or who may have forgotten one of the minor characters. Rinaldi's view is that the Montalbano novels are very much focused on the central character and his internal journey, from THE SHAPE OF WATER, in which Montalbano mainly features as a crime-solver, to the later novels in which he is mired in corrupt politics and moodily aware of his own advancing years. In her opinion, the remaining characters are undeveloped. Perhaps what is not sufficiently emphasised is the humour of the novels, or their unparalleled descriptions of food and the eating of it - always done with simple brevity yet conveying such emotion and gusto. Academics studying or interested in Italian crime fiction will doubtless find this work an essential reference, not least for its comprehensive, annotated bibliography. Readers like me, who simply appreciate the books, will find plenty of interest here, not least the plethora of information about the many untranslated short stories that complete the Montalbano oeuvre.